283. Japan’s Natsu Matsuri & Obon Festivals in Toronto. P. Anne Winter writes about this unique and highly recommended annual summer event. Please save Saturday July 14 for this free combined event at the Japanese Canadian Cultural Centre. Last year, it had everyone smiling and laughing at the different activities, unique to summer months. We actually danced outdoors, heard wonderful big drums, and watched charming specialized dance groups. I wrote about a large children’s area with different types of games. In the pond, kids could “fish” for very pretty small plastic fish. How excited the children were with their magnetic catches. Most of the activities took place in the very large parking lot outside the JCCC. We were able to enjoy the breeze there as we wandered from booth to booth, choosing crafts, for example. Some were made from rare, ancient kimono material. We feasted on unusual food items only available on this occasion. A tradition during this event is to wear a light kimono or yukata. Most people get up to dance. It is a wondrous sight to see all ages from four up to 90, clearly enjoying the moment, waving their arms and moving in unison around the area. For Anne’s 2011 blog on this festival, click on: http://bit.ly/KDGvo6 . The JCCC is at 6 Garamond Court. Is it okay for non-Japanese to come in a kimono? It feels a bit embarrassing as a white person, and I wonder if it amounts to cultural appropriation if not invited. Are we invited to come dressed up for the part? I know I see cosplayers, and while that doesn’t seem to fit with what I know of matsuri, I don’t know that there’s necessarily a problem with it. I would like a better opinion on it though as I only have my own experiences to draw on and they would tell me not to do it just in case. 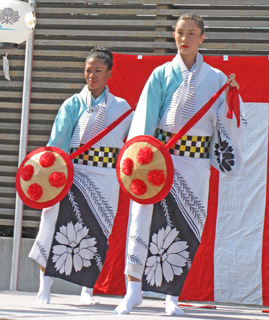 I see a lot of gaijin (foreigners) in Japanese dress at Japanese festivals in Toronto and I don’t think anyone objects. In fact, I think they are pleased, though they might object if the garment is worn incorrectly. I am sure someone will correct you if this happens. I will pass this message to P. Anne Winter who belongs to a kimono club and knows all about Japanese clothes. Ruth. I can only speak from my experience in Toronto at the events that I have attended. The Japanese Cultural Centre welcomes all who are interested in Japanese culture and how they express that. It could be by learning how to make Japanese food, take dance or tea ceremony lessons or study how to make and/or wear Kimono or the summer outfit Yukata. Regarding the Toronto Kimono Club that Ruth mentioned; in Toronto there is a growing group of knowledgeable Japanese and gaijin some beginners who wear Kimono others Japanese who when ever they can. They create a variety of Japanese traditional outings such as admiring the Cherry Blossoms in Spring to going to an English tea house with the option of dressing in kimono. here are opportunities to model kimono or take part in flash kimono events such as the recent one in the Eaton Centre. There are many Japanese and non Japanese who have studied Kimono in Japan and teach or create kimono here. For those who are interested in learning more about this unique opportunity of being involved and learning how to wear it or wish more opportunities to be able to wear the one they own please email me with your name and I can give you more instructions to join.